From the San Francisco Brewing Company and Speakeasy to Magnolia and 21st Amendment, San Francisco has a variety of excellent brewers. But few of them have as interesting a history as Anchor Brewing and none are quite as widely known. 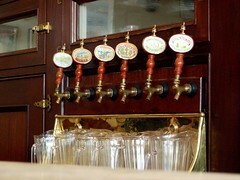 Anchor Steam, the staple of the brewery, is only one of several beers pumped out of the Potrero Hill location every day. They produce 7 beers ranging from the annual Holiday beer, whose recipe has changed slightly every year for the last 32 years, to a hard-to-find Bock. Anchor also has its name on a gin (Junipero) and a rye whiskey and an 18th century style whiskey (Old Potrero), all of which are absolutely delicious. But it is, of course, Anchor Steam that everyone knows. The history of Anchor Brewing is riddled with obstacles and tragedy, including the closure of Anchor brewing in the 50s when delicious, flavorful beer was nearly forced out of the market by tastless light beers. Your Anchor Brewing history lesson begins after the jump. The story starts with a German immigrant named Gottlieb Brekle who opened a little brewery on Pacific in 1854. But it wasn’t until 1896, when Ernst F. Baruth and his son-in-law, Otto Schinkel, Jr. bought the brewery from Brekle, that the name Anchor was born. The trouble began in February of 1906 with the death of Baruth. Then came April with the earthquake and subsequent fire. The brewery was destroyed. They rebuilt at 18th and Hampshire, but before the rebuilding was completed, Otto Schinkel was run over by a streetcar he’d just fallen off of. After Schinkel’s death, German brewers Joseph Kraus and August Meyer kept the brewery going with the help of Henry Tietjen—that is, until the 18th Amendment kicked off Prohibition and brought everything to a screeching halt in 1920. According to the Anchor web site (which is providing the information for this crash course in Anchor history), there are no great stories of Anchor bootlegging during America’s involuntary dry spell. Kraus seems to have stopped brewing for the 13 years that America spent making gin in bathtubs. On April 7, 1933, 8 months before the ratification of the 21st Amendment, booze began to flow again in 19 states and California was one of them (photo from the Anchor Brewing web site). Much to the chagrin of San Francisco’s teetotallers and the delight of its boozehounds, Kraus started producing Anchor Steam again at the brewery’s new location, 13th and Harrison. However, the joy at Anchor lasted for less than a full year. In February of 1934, the brewery burned down, again. Kraus reopened Anchor at 17th and Kansas and found himself a partner in Joe Allen. They remained partners until Kraus died in 1952. By 1959, Anchor was not doing well in the market and Allen was forced to shut it down, but in 1960 Lawrence Steese bought it and reopened it, this time in SOMA (8th between Bryant and Brannan). He brought Allen in as a partner but the brewery continued to struggle. Bar owners in the city didn’t want to keep it on tap (why?!?!?!). It wasn’t until the great-grandson of the appliance mogul Maytag found out that the makers of the nectar he loved to drink at a bar in North Beach were about to shut down that Anchor’s future took at turn for the better. Fritz Maytag bought 51% of the brewery in 1965 and became sole owner (and San Francisco hero) in 1969. In 1971 the first bottle of Anchor Steam was produced, followed by 4 other Anchor beers (Liberty Ale, Porter, Christmas Ale, Old Foghorn) over the next few years. Fritz purchased an old coffee roastery on Mariposa street in the late 70s and in 1979 the first batch of Anchor Steam was brewed at its current location, 1705 Mariposa Street in Potrero Hill. 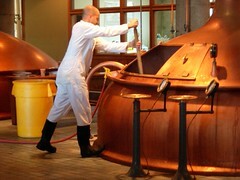 All of Anchor’s beers are still handmade in those amazing copper pots, by hand. There are taps in the kitchen for employees, who also get to take home a case a week (if I remember correctly from the tour). And I still drink Anchor Steam every chance I get. Personally, I am thrilled to see Anchor Steam on tap at bars (perhaps in the similar way that Dubliners are pleased to see Guinness at random watering holes). While other beers take more “awards” these days, Anchor Steam is the granddaddy (grandma?) of microbrews. I might have to genuflect the next time I drink one. One more thing to note, Anchor offers free tours and afterwards, it’s open bar! You get to try all their beers as much as you want. I left after an hour of drinking, but there were still quite a few people who hung around enjoying the product. Many of the choices I make come out of strange senses of loyalty and pride. I won’t drink the stuff from Coffee Bean (they’re from l.a.); give me Pete’s instead. I won’t shop in other cities; let my tax dollars be spent at home! And despite my love for Guinness, my fridge is always stocked with a 6-pack of Anchor Steam. I love holding that bottle; short, with a graceful neck and slopey shoulders. I love that label, lookin all rugged and old school, and proudly declaring in big, bold letters “Made In San Francisco Since 1896”. When I’m out of town and in a bar that I know does not have Anchor Steam on tap, I’ll ask for it any, just to let them know that someone thinks it’s a damn good beer and that they’d be well advised to take that PBR tap and give it to Anchor Steam. Great pick for SF’s 3rd. Pass a pint, and cheers.